And on that note, we bid you farewell. Ghana and Ivory Coast march into the semi-finals, and they will be strongly fancied to meet in the final. But then again, when has this tournament ever been predictable? Join us again on Wednesday for the first semi-final, DR Congo v Ivory Coast, from 18:30 GMT. See you then. Algeria have failed to keep a clean sheet in their last seven knockout games in the African Cup of Nations, their last clean sheet in elimination stages coming in the 1990 final. Nabil Bentaleb completed 100% of the 54 passes he attempted in the match. Algeria will feel even more sore about this game when they look at the stats. They bettered Ivory Coast in every category, and battered them at times, not least from corners. But Ivory Coast keeper Sylvain Gbohouo had a fine match, while at the other end, the Elephants were clinical with their chances. By the way, that bottom stat is worth noting: Ivory Coast have committed more fouls than any other side in this tournament. Herve Renard has certainly instilled pragmatism in his star-studded squad. Mamadi Sirleaf: Ivory Coast look vulnerable through out the game, but comfortable in their build ups to goals. I see a crack up against DRC. Well, they do say cometh the hour, cometh the man, and after a quiet tournament, the much-vaunted Wilfried Bony was the difference today. The Ivory Coast striker didn't contribute much around the park, but he had two chances and tucked both away with dead-eyed efficiency. Algeria were the dominant side for long periods of that match but they just couldn't score the goals that their superiority merited, even against an error-strewn Ivorian defence. Plenty of regrets for the North Africans, who have missed a golden opportunity to win this title. Jonathan Wilson on Twitter:The Ivorians were severely tested but came through and will face DR Congo in the semi. Zaynab: Can't help thinking what would've happened if Belfodil went down in the penalty area. Credit to him for being honest! Ivory Coast have done it. It wasn't convincing, they looked rickety at the back at times, but the Elephants have gained revenge for their 2010 quarter-final defeat by Algeria. They will face DR Congo in the semi-finals with their dreams of ending their trophy drought still very much alive. Algeria go home wondering what might have been had they shown greater potency in front of goal. Ivory Coast have two on two as they break. Junior Tallo finds Gervinho in the centre and he calmly turns and passes the ball into the corner. Game over. Algeria look spent. Ivory Coast have been vulnerable at the back though. Is there one last chance in this? Ivory Coast bring off goalscorer Wilfried Bony. Junior Tallo replaces him. When these teams met at this stage in 2010, Algeria equalised in stoppage time and went on to win in extra time. What price a repeat? Four minutes added. Saphir Taider is booked for mouthing off to the referee. Faouzi Ghoulam swings in a corner, but Ivory Coast clear and they nearly break. A bouncing ball gets Gervinho one-on-one with Saphir Taider and he beats him to stroll clean through on goal, but the referee brings it back for a foul on Taider. It wasn't, you know. Algeria are hammering on the door here. Faouzi Ghoulam curls a free-kick goalwards and brings a sprawling save out of Sylvain Gbohouo. Herve Renard is going postal on the touchline. "That is the sort of thing Algeria need to be doing - going down that wing and swinging in the crosses because the Ivory Coast defence is having real trouble with the height of the Algeria substitutes." Another huge chance for Islam Slimani! Faouzi Ghoulam measures a perfect cross from the left and Slimani gets there ahead of the onrushing keeper, but he directs his header just over at full stretch. Massive chance. Ivory Coast have plenty of men up on the counter, but they choose not to go for goal and it almost comes back to bite them as Algeria break. Sofiane Feghouli threads a long ball into the box and the centre-backs get in each other's way, but Sylvain Gbohouo just gets to the ball ahead of Islam Slimani. Another close shave for Ivory Coast. Sofiane Feghouli's low cross is almost turned in by Islam Slimani at the near post. Ivory coast boss Herve Renard is bellowing instructions at his troops. Could you take him seriously in that pink bib though? Ten minutes for the Elephants to hold out. Incredibly, this is the first yellow card of what's been, ahem, a hotly-contested game. Nabil Bentaleb clatters into Wilfried Bony and goes into the book. Should Ishak Belfodil have gone down there? The substitute weaves his way into the Ivorian box, riding a couple of untidy challenges, but he doesn't hit the deck and his eventual cross is poor. Eyobel gomini: Man City connection making the difference! Bony-Aguero will be a killer combo! Anthony Shaw: I could kiss Bony right now!!!!! Yacine Brahimi winces as Serey Die chops him down. The free-kick doesn't beat the first man though - Algeria need better service than that. Nervous moments for Algeria as Yaya Toure stands over another promising free-kick, but this time his delivery goes straight through to the keeper. Algeria coach Christian Gourcuff wastes no time in responding to that goal. Ishak Belfodil replaces Riyad Mahrez and striker Islam Slimani, who was only half-fit ahead of this game, comes on for Hilal Soudani. Cheick Doukoure came on for Siaka Tiene for Ivory Coast shortly before that goal. "It was right on the head of Wilfried Bony, flashed in from Yaya Toure. Manchester City fans will be hoping that combination will happen a few more times this season." What a one-two punch from Ivory Coast! First they deny Algeria at one end, then they go up the other and take the lead. Yaya Toure's free-kick finds Wilfried Bony at the near post and he gets across his man to bullet a header into the net. "That was a great, great save, he seemed to be going one way and ended up the other. He somehow got his body in the way to stop the ball." What a stop from Sylvain Gbohouo. He may have kept Ivory Coast in Afcon 2015 here. Sofiane Feghouli's centre is turned goalwards by Yacine Brahimi, and Hilal Soudani looks ready to gobble up the opportunity from two yards, but Gbohouo somehow denies him with a brilliant smothering stop. Yaya Toure has been a complete passenger in this game, it's been a head-scratching performance from the Manchester City talisman. Former Arsenal man Gervinho has had a much better game, but he can't quite snake his way through a thicket of Algeria defenders on the left of the box. Yacine Brahimi is so close to sneaking a killer pass through to Riyad Mahrez on the edge of the area, but Serge Aurier does really well to block the pass. All Algeria at the moment. James Earl Kiawoin: Algeria looking stronger and stronger. They keep the ball. Not much of that at this Afcon. Neal Collins: My goodness. Ivory Coast is all over the place. Algeria's passing is beautiful. Take your notebooks and copy, rest of Africa. Goodness me, Algeria were so nearly in again there. Sofiane Feghouli latches onto a superb pass and bears down on goal, but Eric Bailly does well to shackle him as he prepares to unload a shot. Ivory Coast are under pressure here. Lovely interplay by Algeria in the right corner allows Sofiane Feghouli to fizz in a low cross, which keeper Sylvain Gbohouo does well to block. "It has been a great game. It has a bit of everything, both teams are getting forward and an extra 30 minutes here might prove exciting." Algeria are on top now. Carl Medjani whips in a dangerous free-kick from the left, but Sylvain Gbohouo gets a crucial punch in. "It was a poor cross, it should have been dealt with and in the end it was a very easy shot." They're not hanging on any more! Algeria are level, and it's a goal that will have Ivory Coast boss Herve Renard tearing his luxuriant hair out. A long ball causes havoc in the Ivorian defence, Hilal Soudani wins the initial header, he nods it to Riyad Mahrez, whose low cross is missed by Eric Bailly and allowed to trickle though to Soudani, and the striker slams home. Algeria are hanging on a bit here. Gervinho, who is enjoying one of his better days, cuts inside his man on the edge of the box and draws a save from Rais M'bolhi. A breakneck start to this second half. Algeria build cleverly in attack but they turn the ball over and Ivory coast break at speed, Serey Die almost releasing Gervinho. The pacy winger just fails to bring the through-ball under control. "I think we all agree that the standout moment of the tournament so far is Herve Renard having to wear his pink bib. Right now he is customising it, he has a pair of scissors and he is cutting the bib. He is making absolutely sure that if he is going to have to wear it, he will wear it well." Football writer Jonathan Wilson: Ivorians have shut it down well since taking the lead. These two sides are competing for a place in the semi-final against DR Congo, so whoever prevails here will be a heavy favourite to make the final. Algeria were so impressive as a relative outsider at the 2014 World Cup, but has the weight of opportunity stifled their creativity here? Ivory Coast have underachieved in major tournaments on many occasions, but Herve Renard's side don't seem haunted by past failures. Jake Cullingham: As a Leicester fan, Algeria's Mahrez is very underrated. He's helped Algeria through this comp and is shining in the Premier League. "I think Ivory Coast started off very slowly. I don't remember them being in the Algeria half for the first 15 minutes but they started building and got the goal through Wilfried Bony. "Algeria came out and really dominated the game early on and maybe they should have made more of the ball when they had it. The Ivorians have grown in confidence." A fairly even first half in this blockbuster quarter-final, but the telling difference between these two heavyweights has been Ivory Coast's greater threat in front of goal. 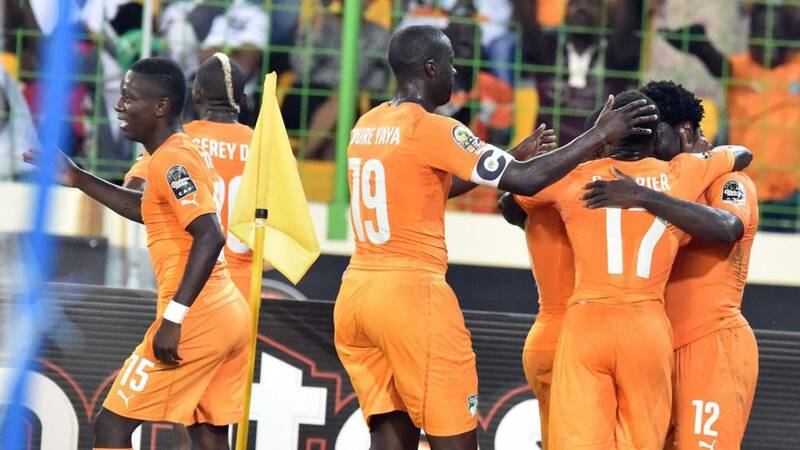 They lead courtesy of Wilfried Bony's first goal at Afcon 2015. Can they hold out? Algeria's Sofiane Feghouli drills in a dangerous cross, and Kolo Toure, taking no chances, puts it behind for a corner. The inswinger is well claimed by Sylvain Gbohouo. Two added minutes. Another long-range effort, this time at the other end. Saphir Taider unleashes a venomous swerving effort, but it's straight at Sylvain Gbohouo. The Fennecs have struggled to pose a goal threat in this half. The newly emboldened Wilfried Bony tries his luck from 25 yards, but he slices across the ball and his low drive skids wide. obasi chidi: Game isn't over Yaya & Bony should know that Algeria can outsmart the Ivorian's. Ivory Coast are quite content to sit in here, challenging Algeria to break them down. Algeria coach Christian Gourcuff looks nonplussed on the sidelines, even more so after Saphir Taider lumps a free-kick straight out of play. A bit of a lull in the action in Malabo. It's been a fairly even first half after Algeria's dominance in the first 10 minutes. Algeria were briefly under the cosh there, but they've recovered their composure well. They're playing the ball around comfortably in midfield, but can they get through those banks of orange? How's this for commitment? Algeria skipper Madjid Bougherra, who is playing with a broken nose, has taken off his protective face-mask. Remember, this will be his last international if Algeria lose. Are Algeria missing Islam Slimani's physical presence up front? It does seem that way. Yacine Brahimi is nimble, but he's well marshalled by Kolo Toure. JavelBleach: Stupid from the Algeria keeper, signalling offside & not bothering to save the goal! 1-0. "Algeria were the better side for the first 20 minutes but they did not create the best chances, Ivory Coast had two of the better chances and took one of those but Algeria will not give up hope. They have come back before in this tournament against South Africa." The big striker picks a big moment to open his Afcon 2015 account. Eric Bailly makes a great run forward from the back and ships it to Max Gradel. He flights a wonderful curling delivery into the box for Wilfried Bony, who has timed his run to perfection, to nod in. Advantage the Elephants. James Earl Kiawoin: Algeria asking all the questions. Ivory Coast not as threatening as they should be on paper. Toure needs to get involved. Ivory Coast almost conjure a sucker punch. Aissi Mandi brings down Gervinho, and from the free-kick, Serge Aurier's glancing header rattles the base of the upright. The rebound doesn't quite sit down for Wilfried Bony. Ivory Coast have committed nine fouls already and they almost pay the price for their latest. Saphir Taider curls in a great delivery from the free-kick, and Kolo Toure's desperate defensive header falls straight to Riyad Mahrez, who can't keep his volley down from close range. Decent chance. "Max Gradel cut inside there and showed what he has been doing all tournament really, although maybe he was a bit selfish and should have looked up and squared to Bony." Max Gradel, who has been one of Ivory Coast's better performers in this campaign, cuts in from the right and leaves Faouzi Ghoulam for dead with a neat shimmy, but he drags his shot wide of the post. Ben Johnson: I've watched about 60mins of AFCON2015 & I've seen Bony make five defensive headers. We NEED that at Manchester City right now. This is a sartorial nightmare. Ivory Coast coach Herve Renard, the ever immaculately-dressed Frenchman, has been ordered to cover up his crisp white shirt with a pink bib, presumably so he's not confused with an Algeria player. The boss takes it in good grace though. A first real chance for Ivory Coast to attack as they counter at pace, Serey Die feeds Gervinho down the right, the winger twists the defender inside out but his cross rolls straight across the area with no-one attacking it. Missed opportunity. Football writer Jonathan Wilson: "The Ivorians have barely had the ball as yet." "In this opening 10 minutes or so it is only Algeria who have been attacking in the opposition half. For all the power the Ivorians have in attack, they have really done very little." Yacine Brahimi shows lovely skill to trick his way into the box on the left-hand side, and his deflected shot causes panic in the Ivory Coast area. Keeper Sylvain Gbohouo comes out to catch but doesn't get there as Siaka Tiene wildly miskicks a clearance, presenting Hilal Soudani with a great chance, but his volley is well held by Gbohouo. Ivorian frustration comes to a head when Yaya Toure steps across Yacine Brahimi to concede a free-kick. Riyad Mahrez's poor delivery doesn't beat the first man though. It's a slick surface in Malabo - some are speculating that that will favour Algeria. They've certainly settled quicker, keeping Ivory Coast pinned in their own half thus far. Mamadi Sirleaf: "This a final before the grand final. Ivory Coast and Algeria are two African giants who are thirsty for the trophy." Riyad Mahrez plays a nice ball down the left to raiding full-back Faouzi Ghoulam, who wins an early corner for Algeria. It comes to nothing though, with keeper Sylvain Gbohouo claiming a nerve-settling early catch. "Yaya Toure has not put himself forward and dominated games like we know he can do. He has not been doing anything like we know he is capable of at Manchester City. I think it is telling that he has not given many interviews, which he normally does." Ivory Coast get us under way. Both teams in their traditional colours - Ivory Coast in orange, Algeria in white. We're almost ready to go in Malabo. There are plenty of Ivorian fans in the stadium by the way - will that give them an advantage? James Earl Kiawoin: Will the real Bony, Toure (Yaya) and Gervinho please show up? Ivory Coast will need your presence against Algeria. Anthem time in Malabo. Some focused looks on the faces of the Ivorians. Do they believe that this is the year that they end their major tournament hoodoo? "Some very interesting team news from Ivory Coast. With the incredible form of Max Gradel in this tournament, who has scored some massive goals, the question was would he start? Or would Gervinho? The answer is both of them, they start alongside Wilfried Bony." Gervinho returns after a two match suspension earned for a red card in Ivory Coast's first game. Algeria are unchanged. Ivory Coast: Gbohouo, Bailly, K Touré, Kanon, Aurier, Y Touré, Gonzaroua Die, Tiéné, Gradel, Bony, Gervinho. Subs: Barry, Diarrassouba, Assalé, Doukoure, Doumbia, Kalou, Gadji-Celi Carmel Junior, Akpa-Akpro, Diomande, Traoré, Mandé. Algeria: M'bolhi, Mandi, Bougherra, Medjani, Ghoulam, Taïder, Bentaleb, Feghouli, Brahimi, Mahrez, Soudani. Subs: Doukha, Cadamuro, Halliche, Mesbah, Lacen, Belfodil, Slimani, Zemmamouche, Kadir, Djabou, Kashi, Zeffane. "It is going to be a fascinating match, it is going to be tough to call and I am not going to make a prediction." Just to underline how big this quarter-final is, these two sides are now the joint favourites for this tournament with the bookmakers. They've only met once before in the Afcon knockout stages, and unsurprisingly it was a tight game, with Algeria prevailing 3-2 after extra-time in 2010. Either former Rangers defender and current Algeria captain Madjid Bougherra or Liverpool and Ivory Coast's Kolo Toure will see their international career end today. Both men have made it clear that the Africa Cup of Nations in Equatorial Guinea will be their final tournament for their respective national teams. So who will it be? "We don't have famous players like them," Bougherra has been telling BBC Sport. "But Africa is different, it's not just about technique, it is about heart." No prizes for guessing that that side are Algeria, rated by Fifa as the world's 18th best team. However, despite that impressive status, they too have struggled to reach top gear at these finals. 2-0 win against Senegal in their final group game showed signs of their best form, and the team that gave Germany a real scare at the 2014 World Cup are sure to be no pushovers in the knockout stages. What to make of Ivory Coast? So often the bridesmaid at this tournament, could this be their year? victory against fellow heavyweights Cameroon in their final group game, plus the exit of a slew of fancied teams, has raised hopes that they may yet end a trophy drought stretching back to their sole Afcon triumph in 1992. Welcome back to our live coverage of the 2015 Africa Cup of Nations. Earlier we saw Ghana beat Guinea 3-0 to book their place in the semi-finals. Now it's time to turn our attention to the last of the quarter-finals, which pits Ivory Coast against Algeria. We're going to bid you farewell for an hour, but we'll be back at 19:00 GMT to bring you another mouth-watering quarter-final: Ivory Coast v Algeria. Join us then. The stats tell the story of a hugely disappointing showing for Guinea. They actually shaded possession, but failed to get a single shot on target, and allowed Ghana to have 11 efforts at goal. The Black Stars were much the more clinical with their opportunities, hitting the target with five and scoring three. So, Ghana advance to the semi-finals for the fifth Cup of Nations in succession, where they will face Equatorial Guinea. The Black Stars will start as heavy favourites. Guinea, by contrast, suffer their fourth straight quarter-final defeat. The wait goes on for the National Elephants. "How many times have we seen Ghana look very good in a quarter-final? It is 33 years since they won this tournament so there seems to be something that changes things after this stage. In Avram Grant they have a manager who looks to have had a great impact on this team, but he is not a man who likes finals, he lost three in his four years in English football. But all Ghana can do is win their games, which they have done very convincingly here." That's it. A straightforward win for Ghana against a Guinea side who simply didn't get going. Michel Dussuyer's side were always the underdogs, and a disastrous first half put paid to their chances of pulling off an upset. Ghana, though never really tested, were sporadically impressive, and in Christian Atsu's second goal they netted a contender for Goal of the Tournament. The farcical scenes continue as Andre Ayew's clever free-kick locates an unmarked Mohamed Rabiu and the sub somehow contrives to fire over from four yards. "I think it was the high foot. It hit Gyan in the top of the stomach. It was a high challenge rather than a last man rule there I think." Bizarre ending to this match. Ghana pump a long ball forward, Guinea keeper Naby Yattara charges out and karate kicks the onrushing Asamoah Gyan - and with around 14 seconds left to play, he's off, and defender Abdoulaye Cisse takes his place between the sticks. Another one for the collection of curious refereeing decisions at this tournament. The referee books Ghana keeper Razak Braimah for timewasting, even though he appears to have rolled the ball out to kick it. Guinea get an indirect free-kick in the box, but Ibrahima Traore's effort is charged down. Guinea, to be fair, do manage a nice moment here, Ibrahima Conte curling a delicate through-ball into the path of Boubacar Fofana, but the midfielder's shot is blocked. Four added minutes. "It is disappointing from Guinea. I was expecting them to try and push more and to try and harass Ghana and stop them playing football. "The problem with Ghana is they usually play so well in the quarter-finals but seem to come unstuck in the semi-finals. I don't know if that is complacency, or a bit of arrogance, but it does seem to come apart for them at that stage." Second change for Ghana. Mohamed Rabiu replaces Afriyie Acquah. Stick a fork in this one, it's done. Guinea look resigned to defeat and are not putting any pressure on the ball. Ghana are being allowed to coast home. A swap for Guinea too as Francois Kamano comes on for Abdoul Camara. That's their last substitution. Anderlecht midfielder Frank Acheampong is on in Ghana's first change. Two-goal hero Christian Atsu departs. Another chance for Asamoah Gyan as Harrison Afful surges down the right and clips in a good near-post cross, but Gyan's header is wide. Ghana are cruising through to the semi-finals, but does coach Avram Grant look happy? Does he heck. Glowering is the best way to describe his disposition on the touchlines. Will the former Chelsea boss begin to withdraw his star players to keep them safe for the semi-final? "Ghana boss Avram Grant has the opportunity to protect some of his players now. Atsu has cramp and Avram has the talent to bring on from the bench. He will want these guys rested and ready for the semi-finals." Out of nowhere, a chance for Guinea. A cross is curled in from the right, Ghana keeper Razak Brimah flaps at it under pressure from Abdoul Camara, but the loose ball won't sit down for Ibrahima Conte and he slices his shot wide. I'm told Brimah has only had six shots to save in the entire tournament and the underworked keeper certainly looked a bit shaky there. Ski Sunday is on BBC2 right now and Guinea are going downhill fast. They concede yet another needless free-kick when Fode Camara chops down Andre Ayew in the corner. Asamoah Gyan is then allowed a free header from Wakaso Mubarak's delivery but he misses the target. Thierry Nyan: Atsu proving why he is a Chelsea player and his accolades in Holland last season. Still drooling over that screamer. Guinea's Boubacar Fofana brings down Andre Ayew and receives a yellow card. It looked harsh, but it matters little now. The intensity has gone out of this game like air from a pricked balloon. Guinea stand off as Ghana pass the ball around on the edge of the area and then let Wakaso Mubarak blasts one over from range. Kwabena Bekoe: What a screamer! Whole of Ghana screamed. xdeemuiz MUFC: Christian Atsu. Take a bow. DJ socke23: What a Goal!!! #Atsu #GHAGUI. Now they show they are the best African team! Guinea's last quarter-final appearance at this tournament ended in a 5-0 shellacking by Ivory Coast in 2008. This could yet be as bad. Can Michel Dussuyer's salvage anything from this match? "What an absolutely incredible goal. It looked like there was nothing on, it looked like he was shaping up for a cross but he whipped it into the top corner. That really was a goal out of nothing. Incredible goal. I'd say it is the goal of the tournament so far." This is a goal that will have Chelsea fans licking their lips. Christian Atsu receives the ball wide on the right flank, cuts inside his full-back onto his left foot and unleashes a bending, dipping peach of a shot which sails over the goalkeeper and nestles in the top corner. Brilliant, and surely decisive. What a waste. Rahman Baba brings down Guinea skipper Ibrahima Traore to concede a really promising free-kick on the edge of the box, but Traore steps up and lofts it over the bar. Guinea desperately to find some quality here. James Earl Kiawoin: If there will be drama in this game, it will be more horrible passing and schoolboy defending. Kevin Constant, who has been disappointing for Guinea, is hooked. Red Bull Salzburg midfielder Naby Keita replaces him. Wakaso Mubarak is enjoying himself out there. He's made a few crunching tackles today, but he demonstrates real finesse with a lovely long pass straight into the stride of Asamoah Gyan. Baissama Sankoh does well to force him wide. It's Ghana on top at the start of this period. Wakaso Mubarak whips a decent free-kick into the box, which keeper Naby Yattara unconvincingly punches clear. Guinea midfielder Fode Camara has committed a few dodgy tackles today, and when he brings down Asamoah Gyan to prevent him haring onto a loose ball, the referee has had enough and takes his name. Gyan blasts the free-kick straight into the wall. Good work by Guinea's Abdoulaye Cisse down the right allows the normally-influential Ibrahima Traore to shape a cross from the corner of the area, but Abdoul Camara can only nod innocuously over the top under pressure. Back under way in Malabo. We've had plenty of drama in the quarter-finals so far - can Guinea provide some more? Well, well. Guinea were given a lifeline in this competition with the drawing of lots to qualify from their group, but they've failed to grasp it here. Ghana's early goal seemed to knock both sides off their stride, and in truth the Black Stars barely threatened thereafter, and then on the stroke of half-time, calamitous defending gifted them a second goal. Guinea haven't scored two goals in an Afcon match since 2012. They'll have to repeat that feat to get back into this match. Kwasi Boafo: I pray Ghana doesn't do a Congo. A very sluggish game. James Earl Kiawoin: Absolutely unbelievable...terrible clearance. My five year old nephew would have cleared that with ease. And that's half-time. Ghana have barely got out of third gear, but they find themselves in a comfortable position at half-time, abetted by some awfully sloppy play from Guinea. We had a huge upset and a dramatic comeback yesterday - you wouldn't bet on it here. Striker Idrissa Sylla, whose injury was possibly the source of the apparent discombobulation in the Guinea ranks there, is replaced by Mohammed Yattara. "Congo went 2-0 and we thought that was that - we know there are comebacks. However, from what we have seen here Guinea do not seem to be able to get on the ball and create anything. There is nothing happening between defence and attack. They just cannot seem to create any forward momentum. I hope they can pick themselves up at half time." Guinea have shot themselves in the foot here. From a throw-in in their own half, Djibril Paye plays the ball back to centre-back Baissama Sankoh, he slices his attempted clearance horribly and the ball trickles straight into the path of Kwesi Appiah, who slips it under Naby Yattara. Ghana have barely merited it, but they're 2-0 up and cruising now. Mr Hammond: Guinea need to calm down or they'll not finish with 10 players. That's probably the clearest chance we've had since the goal. Kwesi Appiah finds Asamoah Gyan in plenty of space on the edge of the box, the Guinea defenders appeal in vain for a flag that doesn't come, but the Ghana striker places a tame finish straight into the gloves of Naby Yattara. Had more time than he realised there. "Guinea have created nothing and it has been disappointing from them so far. You would have thought they would have tried to get back after conceding very early but they have not been in the game at all." It's difficult to say who's really on top in this sluggish match, with both sides turning the ball over far too easily. Ghana are the latest to squander possession in midfield after a good challenge by Rahman Baba. This is crazy from Guinea keeper Naby Yattara. Ghana forward Christian Atsu is caught offside and picks up the ball, and Yattara inexplicably flattens the youngster with a push in the back. Deserved yellow for the stopper. Prince Gyimah: In an AFCON, the referees are more dangerous than the opposition you face. Their judgements are so so terrible. Ghana left-back Rahman Baba lofts in an early cross towards Asamoah Gyan, but the striker mistimes his leap and the chance is gone. The early goal rather seems to have knocked both sides out of their rhythm - scrappy stuff so far. "Ghana are getting these free-kicks on the edge of the area, but are not troubling the goalkeeper or the defence, they just put them high and wide. It just seems a waste after getting up there and winning a free-kick in a key area they are then wasting the opportunity." Abdoulaye Cisse is penalised for a high foot on Andre Ayew. Ghana have a promising free-kick, which is driven over the bar by Jonathan Mensah. In fact, it's taken a big deflection off the wall, but the referee inexplicably doesn't spot it and Guinea escape with a goal-kick. Afriyie Acquah has made a really commanding start in midfield for Ghana. He's been everywhere, and his latest contribution is to pop up on the right to make a brilliant sliding challenge on Fode Camara. Wakaso Mubarak pings a nice ball out to Harrison Afful as the full-back raids forward down the right. He passes to Christian Atsu, who is brought down untidily by Boubacar Fofana. Free-kick to Ghana in a dangerous position, but Mubarak's delivery floats straight out of play. Ibrahima Conte knocks a terrific pass forward to find the run of Kevin Constant down the left. The midfielder's cross is good, but Idrissa Sylla tries to hit it first time and gets it horribly wrong. Guinea are playing some decent stuff though. "There's a contrast between the two coaches in their respective technical areas. Guinea coach Michel Dussuyer is prowling along his technical area, shouting instructions all the time while Avram Grant is sitting down." A long punt forward from goalkeeper Naby Yattara is brilliantly brought down by Idrissa Sylla, but the Guinea forward has a rush of blood to the head and decides to spin and shoot from 30 yards. Ghana keeper Razak Braimah isn't troubled. A good early free-kick almost springs Abdoul Camara down the left for Guinea, but Harrison Afful dispossesses him. Decent response from the underdogs though. Guinea skipper Ibrahima Traore goes for an ambitious effort from the tight angle, but he can only find the side netting. Kevin Constant knocks a hopeful ball forward, but Idrissa Sylla does really well to chase it down and draw a clumsy foul from Jonathan Mensah. Guinea free-kick on the right-hand side of the box. Guinea haven't settled at all. Goalscorer Christian Atsu is allowed to drive all the way to the byline and fizz in a dangerous low cross, which Fode Camara does well to block. "Guinea knew they were coming into this game as underdogs, they knew they were not the most famous of the two teams but now they have a massive task. They must rally quickly." Cambridge United's Kwesi Appiah makes a great run down the left flank, finds Andre Ayew in the box, and the Marseille man sends a brilliant improvised backheel across the face of goal for Chelsea's Christian Atsu, who plays on loan at Everton, to slot in. What a start for the Black Stars. Ibrahima Traore is expected to be the dangerman for Guinea and Ghana are keeping a close eye on him in the early stages. Wakaso Mubarak flattens him with an early challenge. "There is a lot of atmosphere here. It is a tiny, compact stadium and you do get a lot of noise, despite it not being full." We're under way in Malabo - Guinea are in red with yellow shorts, Ghana are in white. Cambridge United's Kwesi Appiah starts for Ghana, who make two changes from last time out: John Boye comes into the back four in the other change. Guinea make three changes, bringing in Djibril Paye, Idrissa Sylla and Abdoul Camara. Ghana: Braimah, Afful, Rahman, Boye, Mensah, Wakaso, Acquah, Atsu, Dede, Appiah, Gyan. Subs: Gyimah, Awal, Badu, J.Ayew, Sowah, Rabiu, Asante, Otoo, Dauda, Amartey, Accam, Acheampong. Guinea: Yattara, Sankoh, Paye, Fofana, Camara, Conte, Cissé, Constant, Sylla, Razzagui Camara, Traoré. Subs: Yattara, Sylla, Zayatte, Landel, Camara, Keita, Keita, Soumah, Kamano, Diarra, Camara. Last night saw the knockout stages of the 2015 Africa Cup of Nations begin with a bang. Compelling, controversial and at times utterly chaotic - and that was just the refereeing. Watched The Voice instead? Never fear, we'll recap the action for you. beat neighbours Congo 4-2. At 2-0 down with 25 minutes left, they looked to be heading out of the competition, but two goals from Dieumerci Mbokani and one each from Jeremy Bokila and Joel Kimuaki hauled them into the semi-finals. qualified for the last four amid barely believable scenes of tumult as a hugely controversial stoppage-time penalty gave them an unlikely equaliser against Tunisia, before Javier Balboa's majestic free-kick sealed victory against a team ranked 96 places above them. The match ended with the Tunisians chasing the ref down the tunnel - I'd wager we've not heard the last of it, either. If today's matches are half as good as those, we're in for a treat. These two Anderlecht team mates are rivals in Malabo today. Ghana's Frank Acheampong and Ibrahima Conte of Guinea had a pre match arm-wrestle which Conte pulled out of with the excuse that "he's too strong for me here but I'll be too strong for him on the pitch." Acheampong admitted head coach Avram Grant had asked him how to handle Conte but the Ghanaian told BBC Sport: "I couldn't tell him how to stop Ibrahima so I just told him how good a player he is." So who is the better player? "You can't compare us in the same way you can't compare Ronaldo to Iniesta," says Conte. "We are different players." Guin it to win it? If Ghana are to end their long trophy drought, they'll have to get past Guinea. the drawing of lots in a Malabo hotel room to progress at the expense of Mali. The National Elephants may have luck on their side, but they'll need to reverse the formbook if they're to upset Ghana today. They have never beaten the Black Stars at this tournament in five meetings, drawing twice and losing three times. Guinea have lost their last three Afcon quarter-finals, and if they do win today, it will be their first trip to the last four since 1976. Before we get to the action, a quick refresher on how these two teams made it to the last eight. overcoming South Africa to qualify as group winners. The Black Stars are familiar enough with the business end of this tournament, having reached the semi-finals of the last four editions, but they haven't won since 1982. Can they end that long wait this time round? Hello and welcome to our live text commentary of the 2015 Africa Cup of Nations. Today, we turn our attentions to the two remaining quarter-finals. Later on, we will see how Ivory Coast fare against the tournament's top-ranked side, Algeria, but first up, it's Ghana against Guinea for a place in the last four. Wake-up call for sleeping giants? Ghana and Ivory Coast. Continental heavyweights. Think of African football, and it is perhaps those two teams which spring to mind above all. The Black Stars and the Elephants. Nations which have given us the likes of Abedi Pele, Samuel Kuffour, Laurent Pokou and Didier Drogba. Yet for all their pedigree, the painful reality is that these two nations are under-achievers on the big stage. Neither has won an Africa Cup of Nations title since 1992, when Ivory Coast hoisted the trophy for the one and only time in their history.